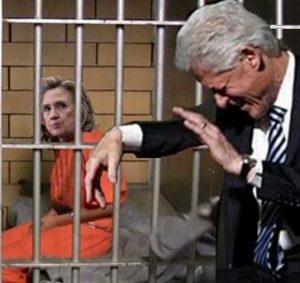 Only one Clinton behind Bars? The Democratic candidate for the US Presidency, Hillary Clinton, is scandal-ridden. The life of the Clintons is a mere scandal starting way back with „Whitewater„. To call her „crooked Hillary“ seems an understatement, viewing only her four years as Secretary of State. Her judgment and her trustworthiness are nil. Never before has there been in the recent history of the United States a greater conflict of interest of private personal gains (Clinton Foundation) and state power (Secretary of State Clinton). From „Whitewater“ to Benghazi, Hillary Clinton’s career is paved with lies. The late William Safire from the New York Times called her a „congenital liar“. As the email scandal shows, Clinton has remained true to herself. No other than her longtime aide Huma Abedin exposed the dark side of this self-styled feminist. Abedin said in „a deposition this week that the would-be president refused others access to her emails and lied to congress about Benghazi“. Clinton demanded from her closest aides „that the private emails she mixed with State Department emails not be accessible to ‚anybody'“. The American political system is politically felted and corrupt to the bones, which is, inter alia, demonstrated by the „accidental“ meeting between Bill Clinton and attorney general Loretta Lynch at the airport in Phoenix, Arizona. Shortly afterwards Lynch declared that no charges will be brought against Clinton. Was Lynch out of her mind to meet privately with the husband of a person under investigation? FBI director James Comey had to spend all his rhetorical skills to evade a lawsuit against Hillary Clinton. Not only this case stinks. By the hour, the news about this corrupt politician who wants to become President of the United States of America shows the dark character of Hillary Clinton. Not only Hillary is „crooked“ like Donald Trump put it but also Bill, Loretta Lynch and even Obama because he supports her wholeheartedly. How come that Bernie Sanders endorsed her at the Democratic convention? Goodwill Industries CEO earns $2.3 Million a year, employs 318,000 employees, and they help 26.4 million people a year, here in the United States of America“, like a commentator wrote. Dieser Beitrag wurde unter US-Aussenpolitik abgelegt am August 29, 2016 von Ludwig Watzal. Simply want to say your article is as astounding. The clearness to your publish is simply cool and that i can suppose you’re an expert in this subject. Well with your permission let me to grab your feed to keep updated with imminent post. Thank you one million and please continue the rewarding work.